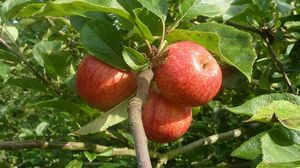 Beauty of Bath - Apple Tree £12.75 - Dessert Apples - Early Season Apple Trees and Fruit Trees For Sale. Buy at competitive prices with wholesale discounts. Beauty of Bath is a sweet and juicy apple with a sharp acid tang. It is one of the earliest ripening varieties and can be picked straight from the tree. 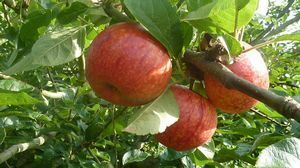 The apples have a beautiful pink stained flesh and a pleasant fruity aroma. They make fairly vigorous trees with good disease resistance and produce regular heavy crops. <br> The apples were very popular in Bath during the 19th Century where they were grown in local orchards. Traditionally straw was spread under the trees to soften the blow as the apples fell to the ground! It remains a very popular household variety to this day. You have to grow this variety because it won't travel. Beauty of Bath is a sweet and juicy apple with a sharp acid tang. It is one of the earliest ripening varieties and can be picked straight from the tree. The apples have a beautiful pink stained flesh and a pleasant fruity aroma. They make fairly vigorous trees with good disease resistance and produce regular heavy crops. The apples were very popular in Bath during the 19th Century where they were grown in local orchards. Traditionally straw was spread under the trees to soften the blow as the apples fell to the ground! It remains a very popular household variety to this day. You have to grow this variety because it won't travel.